Pregnancy can dramatically alter the look and feel of your body. Many of these changes are permanent, and no amount of diet and exercise will restore your pre-baby appearance. All moms deserve to feel beautiful and confident about their looks. The Mommy Makeover is a tailored set of breast and body procedures specifically designed to target the common problem areas women have following the birth of a child. Breast augmentation uses implants to increase the size and improve the shape of your breasts. You will work closely with your Restore SD surgeon to design a plan that provides you with the breasts and silhouette you want. We offer a wide variety of implant options to help you achieve a look that nicely complements your frame. Breast lift surgery treats multiple degrees of sagging, which cannot be improved with implants. The breast tissue is lifted and repositioned as your Restore SD surgeon carefully crafts a more youthful and perky breast appearance. Breast lifts are commonly performed in conjunction with augmentations. 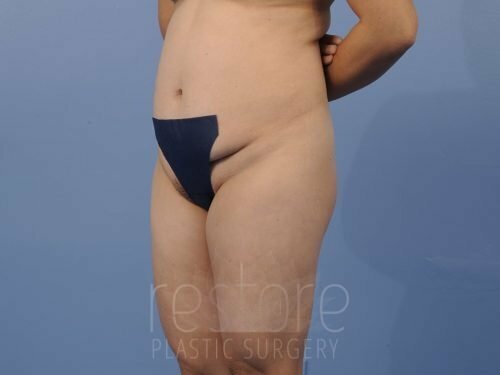 Tummy tuck surgery implements tissue removal and muscle tightening to help restore a firmer abdominal contour. A standard tummy tuck addresses excess skin accumulation from the navel to the pubic mound and provides muscle tightening. Other women may benefit from a mini tummy tuck that focuses on the muscles and improves minor skin laxity. Liposuction uses gentle vacuum suction to eliminate excess fat from multiple areas of the body. While it can improve the contour of your arms, back, thighs, bra line, and neck, liposuction is often used along the stomach and flanks to improve the abdominal contour. It can enhance the definition of your hips and rejuvenate the overall shape of your physique. Call 858-221-4953 today to speak to a member of our award-winning team to schedule a private consultation and learn more about how you can regain your figure with a Modern Mommy Makeover!